A women is trying to change her life for the better, but everything and everyone in her life is giving her more headache than joy. 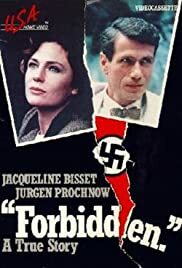 Forbidden is a great film. It shows what a great actress Jacqueline Bisset is. She is not afraid to play difficult roles and she found one most definitely in the role of the highly moral and intelligent Countess Nina von Halder, a young student studying Veterinary Science. Von Halder falls in love with Fritz Friedlander, the son of a former German Judge. He would be highly respectable in any normal society. Unfortunately he is a German jew living in the time of the Third Reich and given the passing of the infamous Nazi German Nuremberg laws in 1935, he is no longer considered a worthy partner for Countess Nina von Halder. Von Halder takes great risks to protect her love carrying on an illegal relationship with him. She chooses to hide him when the authorities start to round up the Jewish people in Berlin. The horror of this process is superbly depicted when the authorities come to collect Fritz's widowed mother, Ruth Friedlander. Ruth is brilliantly played by the multi-talented late Irene Worth. Thankfully both Fritz and Nina both survive the fall of Berlin. Peter Vaughan is thoroughly despicable in the role of Major Stauffel. Nina has made a hiding place in a sofa for Fritz. Thankfully when Stauffel calls Fritz has found another place which goes undetected by Stauffel as Stauffel suspects Fritz is hiding in the sofa and has it machine gunned. This is a film that shows how love can overcome adversity even through the worst of times under a criminal regime. It is well worth watching.